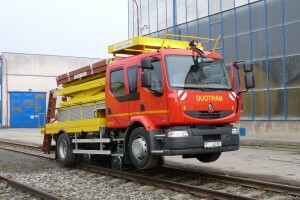 Road-Rail vehicle Renault Midlum Duotram – NP is equipped with an insulated elevating platform (for use under live OLE) and a tools space below. 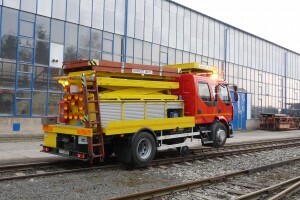 The vehicle is designed for ride and work on road as well as for ride and work on tramway tracks, for example, maintenance operations, transport of material, including self-manipulation under live OLE, in compliance with all safety requirements. The scissor-type elevating platform enables full unlimited rotation around its axis. Side reach, size and loading capacity of the platform meet all requirements for OLE maintenance. The elevating platform has a remote control, it can be controlled from a mobile control panel. 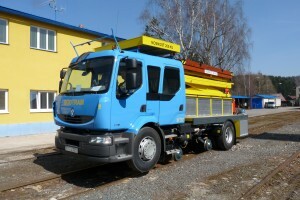 The vehicle is equipped with sand-sprayers system for increasing adhesion in hard terrain conditions. Power transmission during ride on rails is enabled by the vehicle tyres. The vehicle is equipped with CCTV cam system for reverse ride, monitored on LCD display in the driver’s cab, railway lights and illumination system for work at night. All operations on the railway track are controlled electrically from the driver’s cab, the rail gear operations are automatically controlled and monitored on the board-PC.